It is idiotic to deny the basic message set forth by Forks Over Knives – the idea that regular consumption of red meats and processed foods will have/has been having a horrid effect on our weight and general health, and this damage can be reduced or reversed if one adopts a “whole foods, plant based diet”. However, this doesn’t mean that the documentary spreading this word is very good. Lee Fulkerson’s film has a tendency to become relentlessly boring, watching the same few talking heads spew facts and figures, with the occasional personal account that stirs up a meager amount of interest. You don’t really listen until someone says something especially gripping (like a questionable statement that milk isn’t really that good for you, or that six of the eleven people on the USDA’s board of nutritional guidelines have ties to major members of the food industry). We have a few framing ideas that go around the 96 minute runtime. 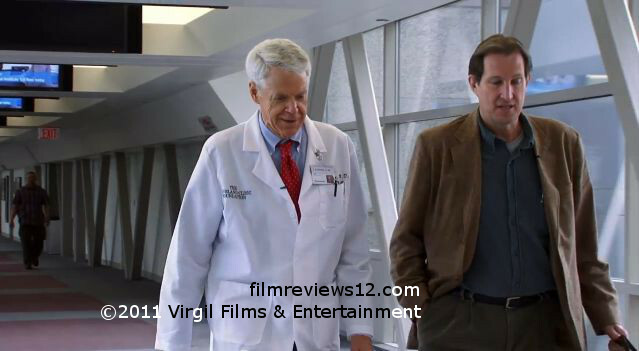 The first is Fulkerson himself consulting a program run by two doctors that support an organic vegan diet, and decides to try their thirteen week program himself. Next are interviews with two of the earliest and most prominent figures of this movement, T. Colin Campbell and Caldwell Esselstyn, and then regular people whose lives have effectively been saved by adhering to these concepts. There are some things that could be perceived as actual factual missteps, but not many. The most egregious was the misreading of the findings of health in Norway, before, during, and after the Nazi occupation of it. The film states that meat and dairy were heavily restricted post-occupation, and during that time, the number of circulatory problems and diseases recorded dropped, before rising after the war when such foods were returned. The figures mentioned were pretty devastating, so I did some research for verification, and found that what is not mentioned in the film was the rationing of tobacco that also occurred at the same time. On a technical level, there’s not much to complain over, but nothing to write home about either. It’s all crisp and uniform, with the standard shots of interviews, a dose of stock footage, and as is the law with health documentaries, shots of overweight people filmed below the head as to avoid any potential legal concerns. Every once in a while a computer generated simulation of an organ under the stress of a medical condition is shown. It’s never consistently engaging, and it has a cold and exterior kind of classroom aide feel running throughout. 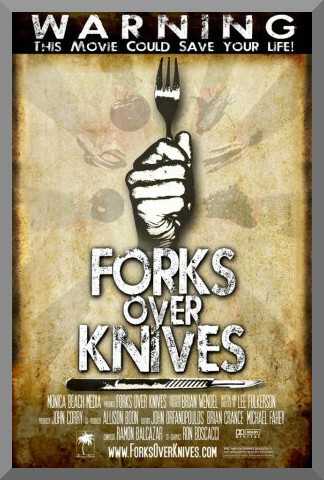 Forks Over Knives is a rare example of a mediocre movie that is highly recommendable. Regardless of whether or not one adheres to its suggestions, it’s still an important subject to be discussed. It is a documentary to be watched for its message, but more contemptible as legitimate film.